UVSHOW plots the uv-data. By default amplitudes vs. uv-radii are presented, for all visibilities and spectral channels. The UVSHOW parameters widget (see Fig. ) permit to select the visibility's characteristic (amplitude, real part, weight, etc.) to plot. By default the different tracks are plotted with different colors. Plotting a model fitted by UVFIT is possible by clicking in the corresponding option. 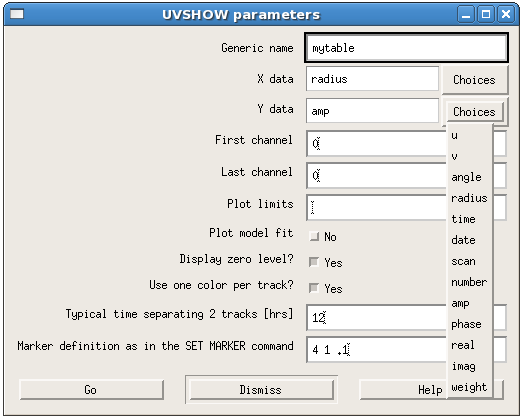 Figure: UVSHOW parameters, to plot the UV-data.